If you’ve always dreamed of going to a runway show, well here’s your chance! 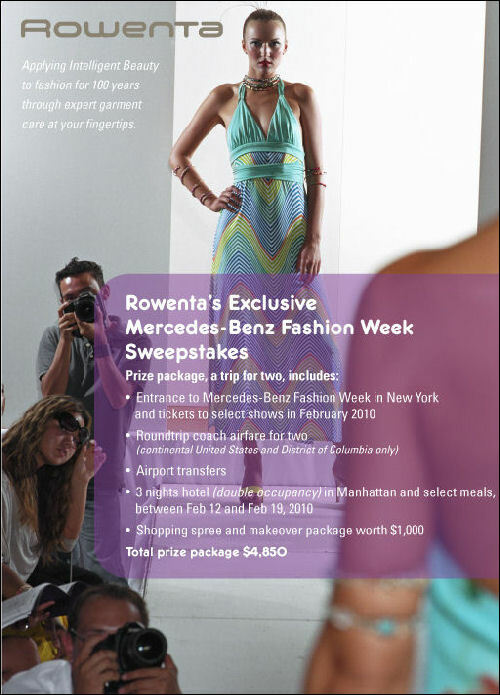 Just enter the Rowenta sweepstakes to win a trip to New York for Mercedes Benz Fashion Week 2010 in Februray. This total prize package is worth $4,850. Enter here! Contest ends November 30, 2009. Winner will be drawn at random on December 4, 2009 and notified by email. sognare e’ l’unica cosa che ci rimane,ma se i sogni si avverano allora si’ che si puo’ volare verso l’america. I would love to win a trip to see my daughter in NYC. She will be thrilled to see fashion with me. I’ve always wanted to go to the “Big Apple.” I would love to see this wonderful city with my niece.